Zoomumba is a Free to play Browser Strategy MMO genre developed by BigPoint for Internet Browser plataform. In this free to play browser MMO players are able to take on the role of both the zoo director and a zoo keeper as they constructs, maintain and manage their own zoo. This casual, colourful and family friendly strategy game is allows everything from building animal enclosures for a variety of cute and cuddly critters (gorillas, meerkats, polar bears, pandas and more), which must then be looked after, to creating a well maintained and decorative zoo to appeal to the zoo visitors and keeping them happy. This Flash based animated game can be played directly in your Internet browser and so does not require any sophisticated systems or hardware and can be played both at home or on the go on any device with a browser. Keeping animals happy and healthy director, ensuring that they are fed and watered, their enclosures kept clean and should they need it a vet called out to take care of any sick animals. By keeping your animals in a good condition it will in turn attracts visitors to the zoo, increasing its popularity, and therefore making it more successful and lucrative, which brings in more money! The main in game currency in Zoomumba is PetPennies, which are gained each time your zoo receives a visit, in doing so it gives you as zoo director the chance to purchase more animals and buildings. 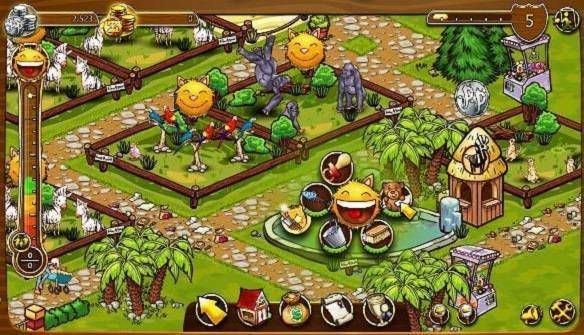 There are dozens of unique buildings that can also be added to expand the zoo such as unique animal habitats, picturesque decorations with everything from trees, statues and fountains that will appeal to visitors as well as concession stands to tend to their needs whilst they are in your zoo. Zoomumba has a huge community of active players so that you’ve never need to play alone, using common social functions like Facebook Connect and its ability to post to your wall players can quickly send gifts and also e-cards to their friends to try and encourage them to join them in the game. Various cooperative quests are available for players to join together and help each other as well as events such as voting on the prettiest Zhou to help encourage a sense of community and friendly competition. Future plans for and in game chat option are already underway to further encourage community peer to peer interaction.